Team Sky's Chris Froome became the first Briton to win the Giro d'Italia as he coasted home in Sunday's processional stage in Rome. The 33-year-old is the seventh man to complete a Grand Tour hat-trick after adding Italian success to the 2017 Vuelta and four Tour de France wins. "For any cyclist this is the dream to have all three leaders jerseys in the space of 10 months," Froome said. "To have finally won this race, I can't quite believe it myself." Froome finished 46 seconds ahead of Dutch defending champion Tom Dumoulin in the overall standings. His victory echoes that of Welsh Olympic gold medallist Nicole Cooke, who won the women's equivalent - the Giro Rosa - in 2004. Britain's Simon Yates, who led for most of the race and claimed three stage wins, finished 22nd in the general classification, with Ireland's Sam Bennett claiming the sprint finish for a third stage win of his own. Froome's triumph also means he is only the third man, after legendary pair Eddy Merckx and Bernard Hinault, to hold cycling's three most prestigious stage races at the same time. The traditional leisurely pace of the final stage dropped even lower as the peloton, unimpressed by the route over Rome's historic cobbles, succeeded in getting the stage neutralised for general classification purposes. Riders only needed to complete the 115km, 10-lap, loop of the city centre to maintain their place in the overall standings. The stage was a sedate end to a dramatic campaign for Froome. Even before the action had started properly, Team Sky's lead rider had skidded out on a reconnaissance lap during the curtain-raising time trial stage in Jerusalem before another crash on stage eight. For the majority of the race he seemed to have faded out of contention, slipping out of the general classification top 10 and nearly five minutes off the pace. Froome admitted that victory was "unlikely" after losing time on the leaders in stage nine. According to Team Sky boss David Brailsford, the Briton came close to abandoning the race altogether. But Froome continued chasing and produced an extraordinary performance on Friday's gruelling 19th stage as Sky abandoned their usual tightly controlled tactics in an all-or-nothing gamble for the pink jersey. After foiling Dumoulin's bid for glory on Saturday with another strong ride on Saturday, Froome was assured his champagne-soaked ride into the Italian capital. Froome's victory comes as he awaits a doping verdict that could force another rewriting of the record books. In December a leaked report revealed he had exceeded the permitted levels of salbutamol - an asthma medication that could potentially affect muscle mass - during his win in the Vuelta three months earlier. With cycling's governing body - the UCI - still investigating and Froome denying any wrongdoing, he has raced on. Froome has been questioned frequently about his use of the drug, with his win on stage 19 being compared to the rides produced by confessed doper Floyd Landis. "I can understand the parallels and comparisons being drawn by some people but I have every confidence it will stand," said Froome. 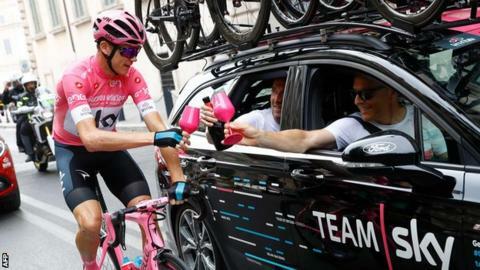 He has encountered hostility from some spectators during the Giro, with one apparently spitting at him on Saturday's penultimate stage after another brandished a giant inflatable inhaler at him the day before.